In 1977 the Soviet Navy adopted a torpedo that could travel underwater at a speed of 200 knots or 370 km/h. The Shkval remains shrouded in mystery. Despite technological breakthroughs in conventional warfare, torpedo attacks by submarines remained the main threat to ships and crews even in the second half of the 20th century. Still primarily armed with torpedoes, subs had to come within attack range undetected, just as they had always done. Yet new anti-submarine and anti-torpedo capabilities allowed enemy surface vessels and submarines to deal far more effectively with threats from below. Since Soviet submarines of the 1960s and 1970s were inferior to U.S. models in their noise levels, Moscow’s engineers looked instead to a revolutionary new weapon design to even up the odds. Developed over the course of a decade, the Shkval finally entered service in 1977. With its still unmatched velocity of 200 knots, the Shkval was twice as fast as traditional screw-driven torpedoes, which remain the main submarine armament in world fleets. This speed advantage was achieved with a rocket engine and by using supercavitation - whereby a nose cone on the torpedo creates a gas bubble around its whole surface at high speeds - to reduce friction in water. After the torpedo is launched from the tube, its pre-programmed autopilot uses a solid-fuel rocket to attain the required course and depth during acceleration to form the gas bubble. When the starter motor fuel runs out, the torpedo’s rear section is jettisoned and the main engine powered by a hydroreactive lithium-based fuel cuts in. 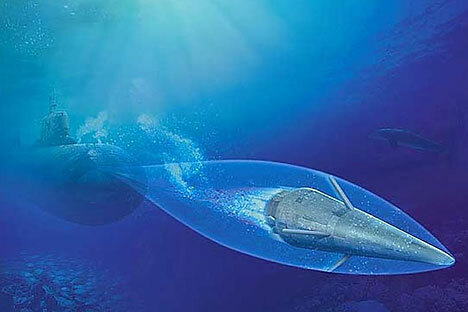 Seawater is now fed through a hole in the nose, enabling the torpedo to race at top speed for 15 kilometers with only its tip in contact with the water. Although supercavitation precludes effective use of a homing system on the weapon, this is more than compensated by its sheer explosive power: Equivalent in TNT to a 150-kiloton nuclear blast, this ensures destruction of an enemy submarine or surface vessel within a one-kilometer radius. Carried by most Soviet nuclear submarines, the 533mm Shkval was regarded as being equally effective in both offense and as a defensive weapon in case of enemy submarine attack. Able to travel six kilometers in a minute, the Shkval could quickly turn the tables on the attacker: While U.S. submarines had the advantage of stealth when approaching and launching the initial strike, the high-speed torpedo could be fired before taking evasive action. So while a sub on the run may be unable to correct guidance data for torpedoes already in the water, the Shkval’s firepower ensured a devastating counter-strike. This unique weapon enabled the Soviet Navy to compensate for inferior stealth of its submarines until this lag was eliminated in the early 1980s. The Shkval came to the notice of the outside world in an espionage case in 2000, when former U.S. navy officer Edmond Pope was tried and convicted in Russia for obtaining secret information about the weapon. Today the Shkval is still a classified Russian weapon, with no known superior design in existence.